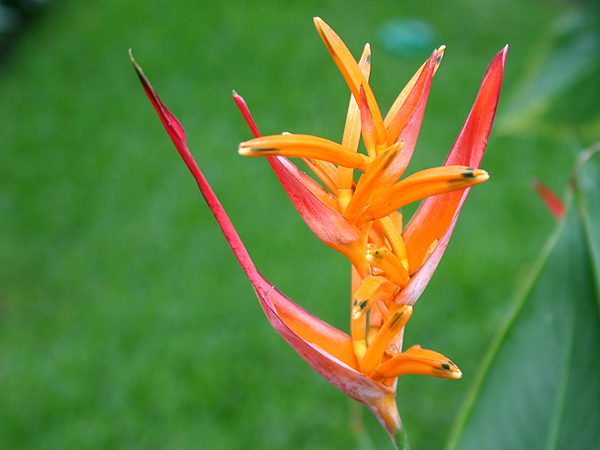 Heliconia has many other names such as Lobster Claw, False Bird of Paradise, Parrot Heliconia and Wild Plantain. 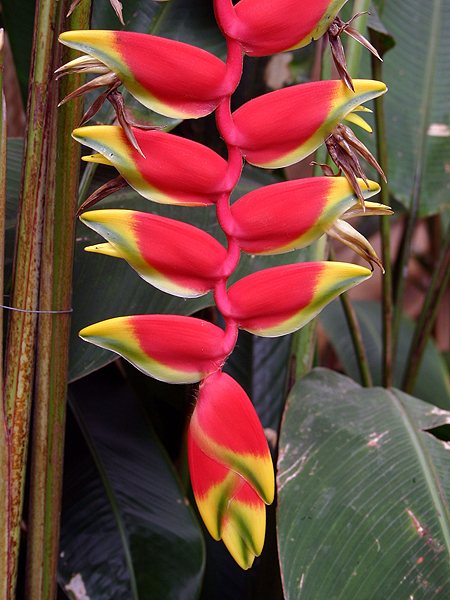 Heliconia is actually relative to the banana, and many of them exhibit banana like leaves, some narrow and some wide. While they are readily visible as cut flowers in local flower shops, these blossoms have been commercially grown. They resemble the plumage of parrots. These plants of tropical America consist of over 100 species. They are native to the tropical Americas and the Pacific islands west to Indonesia. They produce big or small showy, waxy flower clusters that consist of brightly colored bracts; the small true flowers can be seen protruding from these bracts. Clusters can be erect or drooping, from a few inches to several feet in length. These blossoms are spectacular, both in tropical flower arrangements and standing alone in a large vase. 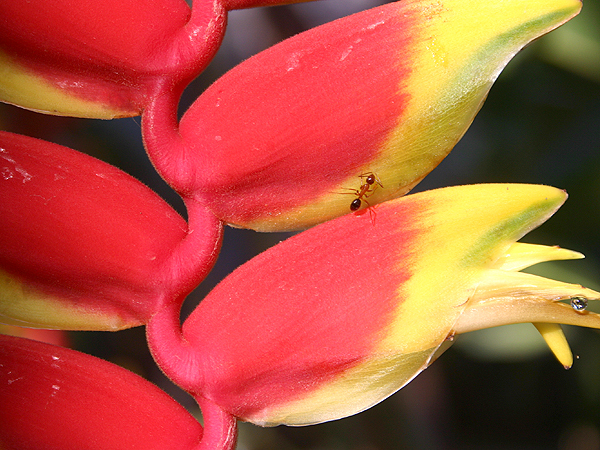 Flowers of the Heliconia are an important food source for hummingbirds in the tropical forest. Hey also use the plants for nesting. The Honduran white bat lives in tents made from the Heliconia leaves. The long to spoon-shaped evergreen leaves are produced in large numbers and increase in size with age. The bloom color may be red, yellow, orange, vermilion or white. Most blossoms are very long lasting, as much as 2 to 3 weeks. 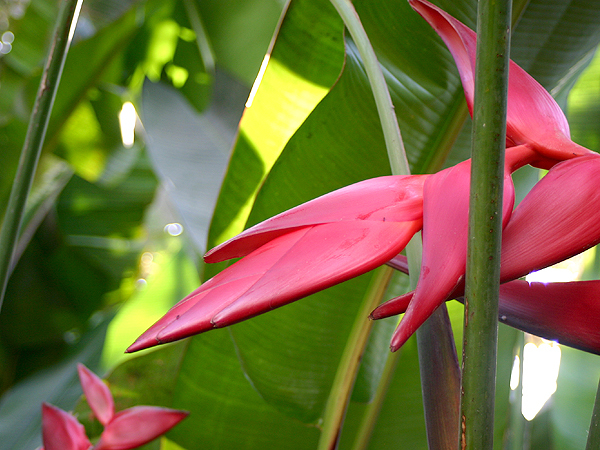 With so many varieties of Heliconia in so many sizes, you have a lot to choose from. There is a size for every location. Some are small enough to use in flower pots, while others stand alone in a garden setting or in a large maceta. They are great to use around swimming pools and in common areas, as they do not shed and are a very “clean” plant to grow. The large leaves may shred some in windy locations, but they are quickly replaced with new ones. Growing Heliconia is easy here in this tropical environment. Started plants can be found at many of our local viveros. But the best way is to have a friend or neighbor that is growing them. You can see the color and variety that you want. They are easily started from tubers (root sections) that are dug up. This is good for the mother plant, as it gives it room to grow. They start out slow, but once they get started, wow! The tubers can be planted in any direction and should be covered with 3 to 6 inches of soil. In this climate, the plants can be planted or started most any time of year. The hot rainy season is not the best, but it still can work. They must have very well drained soil or they will rot. If you are using a potting mix, add at least 1/3 coarse sand or gravel to the mixture. Beware of potting soil that contains a lot of coco fiber. The fiber acts like a sponge and holds in the moisture. Heliconia do best in full sun to light shade (40%). If they are in too much shade, you will have growth but very few or no blossoms. At first give them just a little water until you see the new growth; then gradually increase as the plant gets larger. After the tubers are planted and watered, do not give them any more water until the surface soil is dry. Stems that have flowered should be removed to make room for new growth. Expect to wait 10 to 12 months before you have the first blossoms. Do not fertilize until the green shoots begin to appear. Any balanced fertilizer will do, about once a month. Look for a fertilizer with a large second number such as 5-15-5 or its equivalent. This will promote blossoms but will not burn the roots. If you use the readily available 17-17-17 dry mixture, dilute it with water and use it sparingly. Don’t be afraid of this tropical spectacular. It is grower friendly and reproduces easily. They do have an aggressive root system, but they are not pot splitters like some palms.